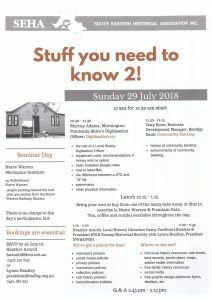 Stuff you need to know seminar 2 – South Eastern Historical Association Inc. Following on from our inaugural ‘Stuff you need to know seminar’ held in February 2017 is ‘Stuff you need to know 2! It’s FREE and it’s on Sunday, July 29 and everyone is welcome! Digitisation 101 – Murray Adams, Mornington Peninsula Shire’s Digitisation Officer. Community Banking – Gary Rowe, Business Development Manager, Bendigo Bank. Where on the net? – free useful local and family history resources (and more) on the Internet. 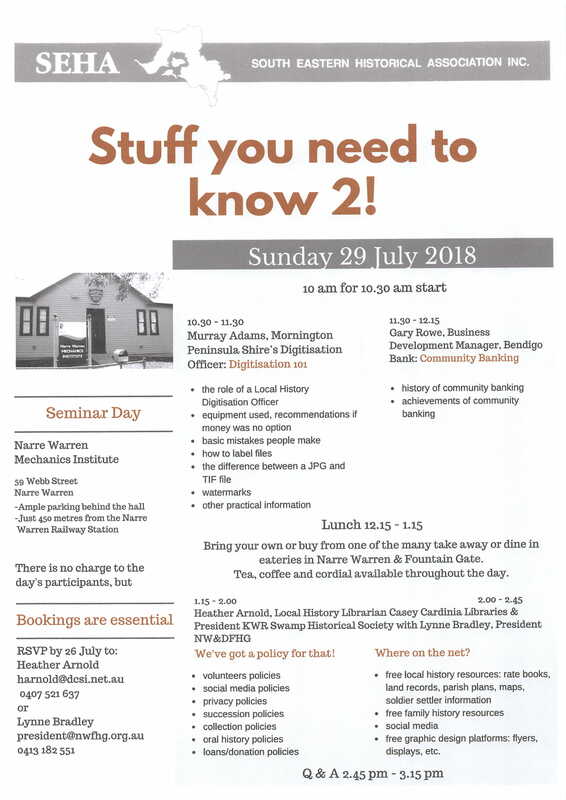 The last two sessions are presented by Lynn Bradley, President of the Narre Warren & District Family History Group and Heather Arnold, Local History Librarian Casey Cardinia Libraries. When: Sunday, July 29 2018, 10.00am for 10.30am. Venue: Narre Warren Mechanics’ Institute Hall, 59 Webb Street, Narre Warren. Bring your own lunch or buy from one of the many take away or dine in eateries in Narre Warren & Fountain Gate. Tea, coffee and cordial available throughout the day. July 14, 2018 Heather A.